Do trophies stack? : The platinum stacks across 5 regional releases. Final Fantasy XV, developed by Square Enix and directed by Hajime Tabata, is an open world action role playing game. You play as Prince Noctis Lucis Caelum who is sent away from his home in Insomnia, capital city of the Lucian Empire, just before Niflheim enters the city under terms of peace agreements. Your objective is to meet with your betrothed, Lunafreya Nox Fleuret, former princess of Tenebrae in order to wed safely away from the enemy, the Niflheim Empire. It isn’t long before Niflheim violates the peace agreement, leaving Noctis and his companions to journey throughout the Lucian empire in search of the power to take back their home. Step 1: Complete Chapter 2, Unlock Chocobos, and Complete Available Side Quests. Completing Chapter 2 opens up the portion of the map where you’re be able to do the quest to open chocobo rentals. Also, because you’ll need 80 side quests total for the Weaving a Tapestry trophy, it’s recommended that you complete them as you can along the way of completing the main story quests. Step 2: Complete the First Quest in Chapter 8 and Complete Available Side Quests. After you complete the first quest in Chapter 8, you’ll come close to a point where the story because more linear and focused until the end of the game. It’s recommended that you take this time before moving on to clean up available side quests for rewards and experience. Take the time to raise Noctis’ fishing skill for the Fishing Expert trophy so you wont force yourself to grind it out all at once later. Step 3: Finish the Story and Enter Post-Game Free Roam. Once you get to Chapter 9 in the story, things will begin to pick up and you’ll just want to finish it up from there. Doing so will get your equipment up to a point where you don’t feel like your gear is not good enough to be on par with monsters your own level. If you’re playing on Easy, remember to take a look at the trophy notes for Chosen King so you have a better idea of when to switch your game to Normal difficulty for that trophy. Once you enter free roam, you’ll have a new set of side quests that weren’t available before you finished the story. It’s recommended that you complete the “A Legend is Born” quest line in preparation for taking on Adamantoise and earning your Platinum. 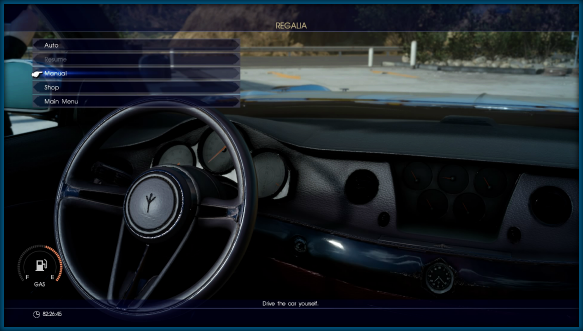 The Regalia is the name of Noctis’ car. After the first side quests in the game, you’ll be able to interact with it by pushing . You’ll have the option to either let Ignis drive, by selecting Auto, or drive the car yourself by selecting Manual. This trophy will unlock once you’re in control of the Regalia. Chocobos are not available until you reach Chapter 3 in the story, and complete a hunt for Wiz at the Chocobo Post. The hunt is called “A Behemoth Undertaking”. Slightly north of the Chocobo post, you’ll reach a small pass inside a mountainous region where the Behemoth makes his lair. Follow the waypoints through the linear area and deal with the Behemoth named, “Dead-Eye” in order to complete the hunt. Note that there is a section of this quest where you’ll have to follow Dead-Eye back to his lair without being seen. A good method for doing this is to allow him to move up until all you can see is his tail, and then pursue him slowly. After you defeat Dead-Eye, return to Wiz who will allow you the ability to rent Chocobos from that point on. Chocobos can be rented by interacting with any of the Chocobo posts that are location in outposts, cities, and settlements. You can rent a Chocobo for up to a period of 7 days, and you can renew or extend your rental at any time. Once you’re rented a Chocobo, it should automatically approach you from nearby the post. If not, simply push and tab over to the “Call Chocobo” option. Interact with the Chocobo by pushing to mount it, and the trophy will unlock. You can not call Chocobos while you’re in a dungeon or in combat. There is a glitch where the game will register you as still being in combat after there are no enemies. To fix this, simply save your game and load the new save. This will force the game to reload your player status and you’ll no longer be in combat. In order to earn this trophy, you must push the to enter the menu, and select the Gear option. 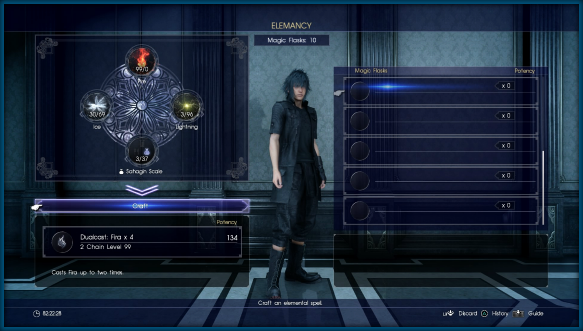 Select Noctis, and fill each of the four primary arms circles with their own weapon or magic. Noctis is the only character that can equip four weapons at the same time. Once each of the four circles is filled, the trophy will unlock. See Self-Mastered for more details. Glitch notice: There have been reports from players that this trophy did not unlock when spending AP on the 50th ability node. If this happens to you, revert back to an earlier save to repurchase the 50th node again and the trophy should unlock. You’ll want to keep this trophy in mind until you earn it. 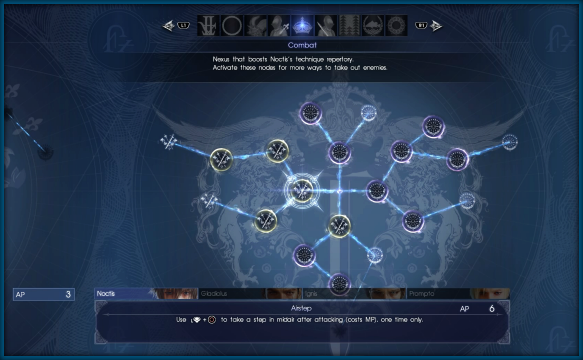 Ability nodes are different upgrades that can be found in the Ascension section of your menu. By the end of the game there are a total of nine categories within the Ascension menu. Each node costs a listed amount of Ability points, or AP. AP is earned initially by leveling up or completing specific tasks. You’ll receive 5 AP each time your character levels up. Additionally, there are ability nodes in the Exploration tab of the Ascension menu that can be purchased to add AP gain to activities like fishing, riding in the car, camping, and riding a chocobo. You’ll want to focus on purchasing abilities in the Techniques, Combat, Teamwork, Stats, and Exploration tabs at first, before branching into other tabs as you progress. The only one I do not recommend you spend any AP in, is the Wait tab. The Wait ability nodes are specifically for the Wait Mode combat style, and are largely useless. The trophy will unlock when you activate your 50th ability node. See Angling Expert for more details. See Survival Expert for more details. See Photo Expert for more details. See Cooking Expert for more details. Each member of the party has a skill that they contribute to the group, and Noctis’ skill is fishing. The fishing skill is raised each time you catch a fish. If you clear out a fishing area by catching each available fish, then you’ll gain about a quarter of a level in experience towards the next fishing rank up to a maximum of 10 ranks. The first fishing area that you’re likely to encounter is in Galdin Quay. Galdin Quay is located south of Hammerhead, along the coast. The fishing spot is on the right-most small dock with a small fishing shop and is represented on your map as a fish with a hook. Simply walk to the end of the dock and push to start fishing. In order to catch a fish, you have to use the to position the blue circle until it turns yellow. This means you’ll cast your line over a fish. If you cast your line and the fish doesn’t immediately react to your lure then try to recast, or try a different lure. The preorder bonus Tidal Leviathan lure works for every fish in the game. When the fish reacts your your lure, reel the lure in for about a second or two then stop. Wait for the fish to move closer to it again, and then do one very quick reel so that the fish will bite your lure. Push the random QTE to hook the fish. Now that you have the fish hooked, you’re have to interact in a minigame to actually catch the fish. There are a few things to pay attention to. The first thing is that you need to keep your rod and line facing the same direction as the first. If the fish is going left, you want to push left on the and vice versa if the fish is going right. If you don’t keep your line going the same direction as the fish, you’ll create tension which will lower the durability of your line very quickly. The second thing you want to pay attention to is when to reel, and when not to reel. You controller will be vibrating the entire time the fish is on the line. You only want to reel when your line is facing the same way as the fish, and the fish isn’t fighting you. You’ll know the it’s okay to reel because it’ll be when your controller is vibrating the least, and you won’t have a tension notification on the screen. The last thing you’ll want to pay attention to is the fish’s stamina. The fish’s stamina is located on the top of the screen and depicted with a yellow bar. The lower it’s stamina is, the closer you are to catching the fish. The best rod you can buy is located at a shop by a fishing point in Vesperpool, an area you unlock after you complete Chapter 7. Using this rod can make almost all except the largest fish easier to catch if you’re just aiming for the trophy. The best rod in the game is obtained by completing the fishing quests, while the best reel in the game is won by betting in the arena at Altissia. The trophy will not unlock until you rest at camp and the fishing skill actually reaches rank 10. In total, this trophy will take between 3 and 4 hours. However, it is recommended that you level fishing in shorter intervals because there are side quests tied to fishing as well. Each member of the party has a skill they contribute to the group, and Gladiolus’ skill is Survival. Leveling survival is one of the more time-consuming skills to reach maximum level with and of the four skills it should be the last one you unlock. Survival levels up by taking steps. Steps taken on a Chocobo or distance traveled in the Regalia does not count towards this skill. For the least amount of post-game grinding for this skill, it is recommended that you spend a lot of time walking yourself to as many objectives as you can. It really helps if you group in as many hunts and side quests as you can to one area and walk to each one as well. 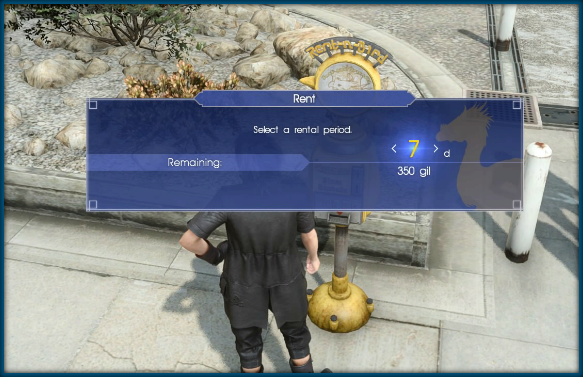 The survival skill affects the sort of variable items that Gladio will find after each time you complete a battle. You’ll notice in the bottom right of your screen after combat that it will say Gladio has found a particular item. These items get better the higher your skill gets. You can also level up by rubberbanding your controller so that Noctis runs in circles while you’re idle. If you use this method, be sure to start in Hammerhead because the other members of the group often move Noctis one way or another and other areas are easier to get stuck it or run into danger and get you killed. This trophy will not unlock until you rest at camp and the survival skill reaches rank 10. Each member of the party has a skill they contribute to the group, and Prompto’s skill is Photography. Leveling photography is essentially based on steps taken. 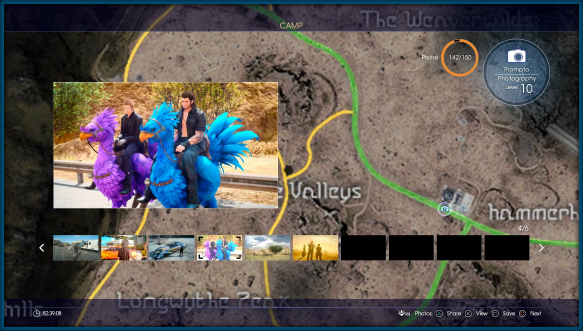 Prompto will take pictures randomly as you journey around Eos and the pictures he takes can be viewed and saved every time you rest at camp. It’s important to note that only a certain amount of pictures can be taken between resting periods, so it’s important to camp at least once a day to be sure you don’t reach capacity and miss out on pictures taken. You can also equip the ‘Camera Sstrp’ accessory which will allow Prompto to take an extra 5 pictures, for a total of 20. Aside from walking around, you can also equip and use Prompto’s “Snapshot” ability in combat so that he takes a picture. Also, Prompto will occasionally ask if you want to take a picture while you’re traveling around different landmarks in the world. If you accept his offer, he’ll take a picture and these opportunities also count as completed side quests for the Weaving a Tapestry trophy. You can also level up by rubberbanding your controller so that Noctis runs in circles while you’re idle. If you use this method, be sure to start in Hammerhead because the other members of the group often move Noctis one way or another and other areas are easier to get stuck it or run into danger and get you killed. You will have to return every hour or some real-time to camp and reset the photos taken so you don’t reach photo capacity. This trophy will not unlock until you rest at camp and the photography skill reaches rank 10. Each member of the party has a skill they contribute to the group, and Ignis’ skill is Cooking. Cooking is increased specifically by resting at campsites out in the open world. You do not have the option to cook, or eat, if you stay in a hotel room or the campers located at rest areas or settlements. 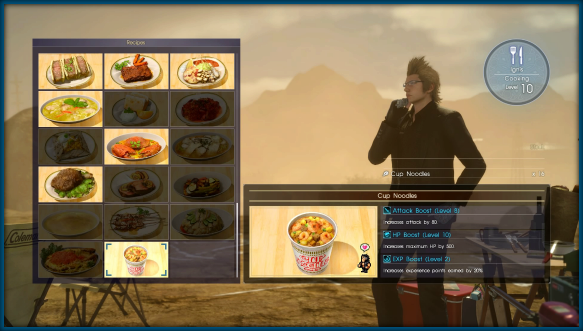 Eating at restaurants does not increase your cooking skill, but Ignis can learn new recipes by trying different foods. You can also purchase different recipe books and ingredients at shops around Eos. Most of the ingredients you come by will be from hunts, battles, fishing, and gathering. The higher level recipe you choose at camp, the more experience you earn towards leveling your rank. You should also try to choose foods that your party members favor if you can help it, because they’ll gain a boost in experience. This trophy can be farmed out very quickly by repeatedly resting at camp, but doing this is only recommended towards the end of the game if you still don’t have the trophy unlocked. Chances are you’ll earn this trophy if you’re cooking while aiming to rank up Prompto’s photography for the Photo Expert trophy. This trophy will unlock after you cook the last meal to reach rank 10 in cooking as the ranks screen is very shortly after you select your meal. A point-warp suspension is when you hold while facing a wall or another tall objective during combat to pull yourself out of the heat of battle to safely recover, or prepare a critical assault. Be sure that when you’re attempting a point-warp suspension that you are not targeting an enemy or you may warp to the enemy instead, which does not count towards this trophy. The trophy will unlock when you successfully perform a point-warp suspension. An ally command is performed in combat when you have enough “tech bar” charge to perform an action. The tech bar is depicted as a green line on the lower left side of the screen while you’re in combat. The early skills in the game, like Prompto’s Piercer move cost one tech bar to us. To perform an ally command, hold and use the to select a move when you have enough tech bars to perform one. Note that allies can not be ordered to perform abilities if they’re incapacitated or too far away from the enemies. When you order your ally to perform a move, the game will cut away to show your ally performing the skill and the trophy will unlock. A blindside attack is when you attack an enemy from behind which gives you a bonus to the amount of damage you do. A blindside link is when you perform an attack from the flank of an enemy, and an ally joins you in your attack. This bonus action happens randomly as long as an ally is nearby, so you don’t need to do anything other than attack an enemy from behind for it to occur. The trophy will unlock during your first blindside link. In order to parry an attack, you have to hold when the onscreen prompt appears until you’re attacked by an enemy and then push as soon as the prompt appears. Follow up the block with an attack to perform a link-strike as long as an ally is close by. You’ll have an opportunity to parry in nearly every battle, so this trophy should occur naturally as you get used to the combat. This trophy will unlock during the link-strike attack. The Armiger isn’t available the Trial of Titan quest at the end of Chapter 4. You do not actually need to equip the Royal Arms to use Armiger. While in combat, you’ll notice a blue circle surrounding your weapon options on the lower left of the screen. When the blue circle is full, you’ll be able to use Armiger in combat. This circle is static, which means that the charge carries over from battle to battle and you can save it for tougher enemies if you choose too. Otherwise, to activate it you need to push and hold and at the same time while you’re standing still in combat. The activation of Armiger can be finicky. If you get hit while you’re trying to activate it then it will not activate. It’s best to stand out of danger within the combat zone. After you activate Armiger for the first time, the trophy will unlock. In order to craft a spell, go into the menu by pushing the and select Elemancy. This will bring you to the Elemency page where you can create spells. First you’re going to select an empty flask on the right side of your screen, which will move your cursor to the left side of the screen. You’ll need to have harvested from a fire, ice, or lightning node to have the resources to create a spell. These nodes can be found frequently surrounding campsites all over Eos. Once you’ve selected your flask, you’re going to use the to move over either fire, ice, or lightning and use and to adjust the amounts of each you want in your spell. The higher the number of resources used, the more potent the spell will be. You can craft a spell using a minimum of one resource, or you can also choose to enhance a spell but spending an item in it’s creation. If you want to add an item, select the bottom empty circle in the creation screen and choose whichever item gives the spell effects you want. Once you have the spell the way you want it, push down on the and select craft to create the spell. The trophy will unlock right after you select the Craft option. Magic in FFXV is a consumable resource. It has to be crafted and equipped from materials you’ve gathered during exploration. See Magical Worker if you have any questions about crafting spells. You can equip spells immediately after you craft them in the Elemancy screen, or you can select the Gear option in the menu and select a slot to equip a spell to. Spells you’ve already crafted are found in the Spells tab of the gear screen. After you equip a spell, you can use it in combat similar to any other weapon. Locking on to an enemy will not auto cast the spell. You have to hold and use the joysticks to choose where you want the spell to land. When you have the spell where you want it, release the button. The trophy will unlock right after the spell is used in combat. The Six refers to the six Astral’s in FFXV; Titan, Ramuh, Leviathan, Shiva, Bahamut, and Ifrit. Carbuncle is only available to you if you played Final Fantasy XV Platinum Demo to the end and named Carbuncle. Carbuncle also only appears in Easy mode to revive you if you’re downed but it not part of the Six referred to by the game or this trophy. You’ll unlock your first Astral after completing Chapter 4. Keep in mind that summons that happen as the result of story progression aren’t counted for this trophy. Each of the Six has their own circumstances for appearing that have to be met in order to have the option to summon them. You’ll know a summon is available because the screen in combat will darken, the music will change, and white glowing lights will be suspended on the battlefield. Once the prerequisites are met, you’ll have to walk out of danger and hold until Noctis kneels and the summoning begins. Titan – An Ally enters the danger state. Ramuh – The battle goes on for a set amount of time in relation to level of the enemies and your own levels. Leviathan – Noctis enters the danger state in combat near water. Shiva – Enemies are significantly higher level than you, and combat is near water. Ifrit – Enemy, can not be summoned (Does not count for the trophy). Bahamut – Can not be manually summoned (Does not count for the trophy). After you summon an Astral for the first time, the trophy will unlock. JUSTICE MONSTERS FIVE is a pinball-style game located inside most diners of rest areas just left of the door. You simply have to walk up to the machine and interact with it by pushing to play. You don’t need to beat any of the levels in the game, you just need to play it once. The trophy will unlock after you play JUSTICE MONSTERS FIVE for the first time. See Weaving a Tapestry for more details. There are three types of quests in the game; sidequests, hunts, and main story quests. Side quests are shown with blue names in your quest tab of the main menu. These quests largely consist of fetch quests, but also include fishing, photos for Prompto, world encounters, and killing specific monsters for items. Quests are usually accepted by interacting with quest givers depicted as yellow question marks on your map, but can also be accepted through dialogue with Prompto, as well as NPCs called for help as you’re wandering through Eos. If you aren’t actively taking on quests in between story missions, then this trophy will seem like a huge grind at the end of the game. Therefore it’s recommend that you try to clear the map between main story quests for the first 3 chapters. Not all sidequests will be shown on the map right away. 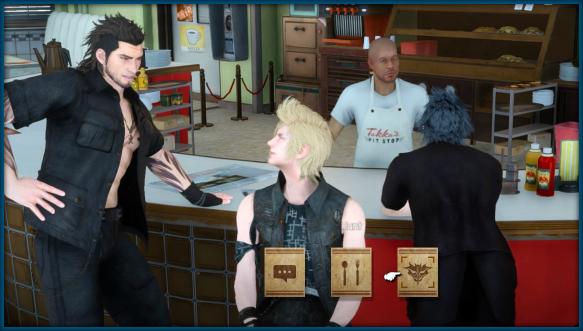 Some sidequests will require you to interact with the cooks, shown as a fork and spoon on your minimap, and request information a few times until no more information is available. There are about 120 side quests in the game, so you only have to complete 80 of them to earn the trophy. Hunts and main story quests do not count towards the trophy. The trophy will unlock as soon as you complete your 80th sidequest. A hunt is a bounty contract you accept to kill specific monsters around Eos. Unlike normal monsters, these bounty monsters have increased stats to make them more of a challenge to defeat, but completing contracts is more reward than most side quests in terms of gil and experience. In order to start a bounty hunt, you have to visit a restaurant or diner and speak with the cook. He’ll have three options for you to choose from, but you want to select the option on the far right that looks like a dragon head. This is the hunts tab, where you’ll be able to take on contracts at your leisure. It’s important to note that unlike side quests, you can only take on one contract at a time. Every diner or restaurant has its own set of hunts as well, so it’s worth checking them out at every settlement. The trophy will unlock after you turn in your first completed hunt. The Prologue works as an introduction to the game. You’ll be introduced to a few basic features and be tasked with completing a hunt before you continue on with the story. This is where the game will teach you about how to take on hunts, campings, side quests, and the Regalia. The trophy will unlock once you regain access to the Regalia. The trophy will unlock at the end of the main quest entitled “Ill Tidings” when Noctis and the group agree to return to Hammerhead. The trophy will unlock at the end of the main quest entitled “Declaration of War” when you enter into a new portion of the map. The trophy will unlock at the end of the main quest entitled “The Way of Gods and Kings” after the group agrees to travel with a temporary companion. This trophy will unlock at the end of the main quest entitled “The Trial of Titan” after the group finishes the trial and while the cutscene is playing into the next chapter. This trophy will unlock at the end of the main quest entitled “Engaging the Empire” after returning to Lestallum. This trophy will unlock at the end of the main quest entitled “All Set to Sail” after a member of the party temporarily parts ways with the group. This trophy will unlock at the end of the main quest entitled “Party of Three” after the party is taken back to Lestallum. This trophy will unlock at the end of the main quest entitled “Brave New World” during a cutscene to a new area. This trophy will unlock at the end of the main quest entitled “The Trial of the Leviathan” during a cutscene before the transition to Chapter 10. This trophy will unlock at the end of the main quest entitled “The Hand of the King” during a cutscene before the transition to Chapter 11. This trophy will unlock at the end of the main quest entitled “Express Train for Trouble” during a cutscene leading into chapter 12. This trophy will unlock at the end of the main quest entitled “Breath of the Glacian” during a cutscene before the transition to Chapter 13. This trophy will unlock at the end of the main quest entitled “Reunion and Recovery” during a cutscene before the transition to Chapter 14. This trophy will unlock at the end of the main quest entitled “Head to the Throne Room” during the final cutscene. Reload your save to start at the final save location before the Ifrit fight and use Umbra to return to free roam. The fight with Ifrit takes place in Chapter 14 just after the King Behemoth fight. If you’re playing on easy, be sure to change the difficulty before the Ifrit fight at the camp after King Behemoth. As far as fights go, Ifrit is a lot like Ravus from Chapter 13. He has a lot of HP, high defense, and he has several AOE moves to be aware of. You can use Blizzard to momentarily put out the fire surrounding Ifrit and greatly lower his defense, but in large part the fight will consist you a more hit and run approach. You’ll want to use the light posts and the nearby building to get as far as you can away from Ifrit while still remaining in range, and then warp strike attack him. You’ll repeat this process in addition to using your tech abilities and Armiger to wittle away his health. Every so often Ifrit will grab Noctis and initiate a QTE struggle. If you win, you’ll take a chunk of his health. When Ifrit gets down to about 20% HP, a summoning will occur. You’ll want to remove yourself from immediate danger and hold to summon and begin a cutscene. After the cutscene ends and you regain control of Noctis, the trophy will unlock. If you’d like, you can revert your difficulty to Easy from here on out. In order to unlock the Regalia Type-F, you’ll have to finish three assaults on Nifelhim bases in Lucis. Two of the bases will already have been done in the course of completing main story quests, leaving just one to complete on your own. The base you’re looking for is is north of Hammerhead outpost. If you drive by it in the Regalia, the party will comment on a Niff ship flying towards the base. The base itself is represented by a flying flag on your map in the post game. To start the assault on the base, you need to go to the top of the guard tower on the northern side of the base and interact with the point on the top level. You can stealth kill or outright assault the base if you prefer, but if you are spotted then be ready for a long battle. Once you defeat the boss of the base you’ll receive a strange part that the party will say you should ask Cindy about. When you bring the part of Cindy after assaulting all three bases, Cindy will turn the Regalia into the Regalia Type-F. The Type-F is a car that can transform into a small airship. It doesn’t matter who is driving the car, Once you hit a certain speed you can push to transform the car into the airship form where you will have full control. Be sure to land Regalia back on the road because anywhere besides the road is an instant game over. The trophy will unlock after you take flight and the Type-F fully transforms into an Airship. Bug in the Costlemark Tower: There is currently an issue where if you do not have the Costlemark Tower quest set as your active quest, the elevator that leads to the final dungeon boss will glitch, the boss will not spawn, and the dungeon will need to be repeated. To avoid this, save just before you enter the dungeon and be sure to have to dungeon quest set to active before entering. Royal Arms, as introduced in the story, are the weapons of the old kings of Lucis. Unlike other weapons in the game, enemies can not resist their damage regardless of their resistances or the weapon type. Each royal arm provides a unique benefit, so having one or two of them equipped just for their stat benefits is up to you. Note that when you actually use a Royal Arm weapon in combat, each hit landed takes away some of your own health as well. You can use gear to counteract this with health regeneration speed, or potions. The trophy will unlock during the cutscene where you pick up your last Royal Arm. Gentiana is Lunafraya’s advisor of sorts and you’ll see her a few times throughout the story. After you complete Chapter 5, Gentiana has a random chance to appear in Prompto’s photos when you view them at camp. There is nothing you can do to encourage this to happen at a given time. Gentiana is not limited to appearing at any point or any time in the game, so getting a picture with her is random but it’s also frequent. You’re likely to have 4 or 5 pictures with her in the background by the time Prompto’s photography skill reaches level 10. The trophy will unlock when you select a photo with Gentiana in the background while you’re resting at camp. You do not need to save the photo for the trophy to unlock. Use Umbra to travel back to Past Lucis, and Cindy will call you and tell you about a sudden rash of earthquakes in the region near Hammerhead. This will give you a quest entitled “Let Sleeping Mountains Lie”. Follow the quest through to the end in order to open up the hunt for Adamantoise entitled, “Lonely Rumblings in Longwythe”, which can be started at the diner in Hammerhead. The hunt itself is level 99, but you can easily complete it around level 45 as long as you’re somewhat prepared. The fight will last for between 45 minutes to an hour using the method below, which is one full day in game. Unlock and equip Noctis with the sword called Iron Duke. This weapon is earned as a reward for completing a quest entitled “A Legend is Born” which can be found in Lestallum after you complete the story. Eat “Spicy Skewers” before accepting the hunt to raise your damage. The recipe is learned by eating Spicy Skewers at Tostwell Grill in Lestallum for 9,800 gil. Activate the ability nodes for Warp Damage 1 and 2, as well as the node for increased food duration. Switch out your accessories and gear to prioritize damage the nature of the fight is damage, and you wont really be taking much damage yourself throughout the fight. Stock up on potions and elixirs just in case you are hit so you wont die. If you die, you start the fight from the beginning. When you finally approach Adamantoise, you’re going to go towards the front of his right paw. Target Adamantoise and try to select the higher target that seems like it’s behind his actual paw, and warp strike. You wont actually reach behind his paw, instead getting stuck on the top of his paw and avoiding all of his attacks. Because Adamantoise is one giant target, you’ll still do damage to him like you’re warp striking him from long distance each time because you’re locked on to a part of him that’s further away. You should hit for 5.5x damage or above per warp strike which will do upwards of 7,000 damage per hit. When you run out of MP, you’re going to point warp to the rock you used to target his paw initially and regain all of your MP so you can repeat the process. When you do enough damage, Adamantoise will lay his head down and become vulnerable for a short time. You’re going to want to focus on his eye where you’ll hit for 9,999 each hit in exactly the same way that you attacked his paw. When he lifts his head again, return to attack his paw just as you were before and repeat the process. When Adamantoise drops below 50% HP, his attacks become more frequent and he will begin to pull his paws back and launch them forward. This does not change your method of attack, but it does mean you need to be careful when you’re transitioning from attacking to returning to your warp point and back again. Alternatively, you can also use daggers and avoid Warp strike spam almost entirely using the method in the video below. Keep in mind it may take you longer than 8 minutes to complete at a lower level or with less set up, but the strategy can still work for you. The trophy will unlock after you return the contract for the hunt in to the diner in Hammerhead.